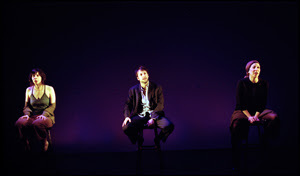 My review of Rearviewmirror at 59E59 Theatres. In Time Out New York. Re-reading this, it comes across that I just don't like monologue-plays. Well I don't. And for good reason, I think. Sure, being in the presence of a great actor telling a great story can be good theatre. But that just didn't happen in this case. And for me, good theatre has to be something other than words being said on stage. Call me biased that way. But there you have it. Rearviewmirror, for the record, is not a one-person show, but three intertwining, simulatneous monologues with actors mostly face out. But for me the essential problem of the monologue play persists. As all our writing teachers always admonished us: show, don't tell. For me, great drama shows. (Or demonstrates. Enacts.) Telling is the easy part. Brian Friel--who I reference in the review (and who I know has not only written monologue plays)--can get away with it due to the sheer beauty of his language. And he's been helped by some great actors over the years. But have you ever sat through an amateur production of Molly Sweeney? There's lots that can be said about why the monologue play as a form is exploding now. Is it the economics? General resurgence of "spoken word" culture? A topic for another time. Meanwhile, I only state this bias so you may keep it in mind while reading the review, and hopefully I've communicated enough about the play so you can decide if there are other things about that interest you. Don't you have an obligation to reveal that you hate monologue plays (Regardless of whether your reasons are "good" or not) within the confines of the review itself? The reader should know what biases you are operating with so that they can evaluate whether or not your opinion is a reasonable gague of what there's will be. I mean, you'd expect a reviewer who hated musicals to say "I really don't like musicals because of X. Y and Z" before panning Spring Awakening, wouldn't you? To answer your question in a word: no. I don't think my rationally grounded dislike of monologue plays in general needs to be "disclosed" as a "bias" akin to, say, sleeping with the director. (Or, in negative reviews, divorced the director.) I would hope that I made the GROUNDS of my problem with the chosen form of the play clear in the print review itself. I'm pretty sure a rational reader could conclude from the review that I have a problem with the genre in general. It's not like I was hiding it. Now if I had more than 250 wds in Time Out, I would have been happy to pontificate on the limitations of the form in general. But them's the breaks. In 250wds, I have to deliver a clear and succinct verdict. No room for disclaimers or really much "first person" stuff at all. If I feel going into it that I have a genuine "conflict of interest" I simply tell David Cote I won't accept the assignment. However, I did feel like expanding on the point here on the blog since I have space to do so, and it offers some context to the review. Plus I hope(!) perhaps some further reader comments and debate over The Monologue Play: Pro and Con. As for any "misleading" of the Time Out reader, I hope I communicated the contents of the play clearly enough so that if someone decides they LIKE monologue plays, they can feel free to go. Hey, it's all just one man's opinion, isn't it? So people should feel free to post links here to any more favorable reviews of Rearviewmirror. Including yours, Isaac! About which--speaking of full disclosure--we should point out your friendship with the playwright, right?